Plantronics announced it would be acquiring Polycom for around $2 billion at the end of March 2018. Now a year on, Plantronics and Polycom have taken this opportunity to completely relaunch a seemingly new business, rather than taking one of the pre-existing brands forward. There is much more in the formation of Poly than just a new logo and branding. Poly will also focus around different areas of innovation designed to drive the new company forward into its next stage of development. A fundamental part of the new brand is its new name, Poly, which is far more than just an abbreviation of one of the previous brands, Polycom. Poly, in ancient Greek, means “many”. The new brand aims to leverage the traditional audio and video expertise of Plantronics and Polycom as well as the breadth of smart endpoints from the previous portfolios. 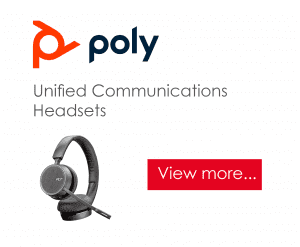 NEW: View the Poly Unified Communications Headset range available at Digicom. Unsure about the right product for your business? Contact us for more information on Poly Business Solutions.